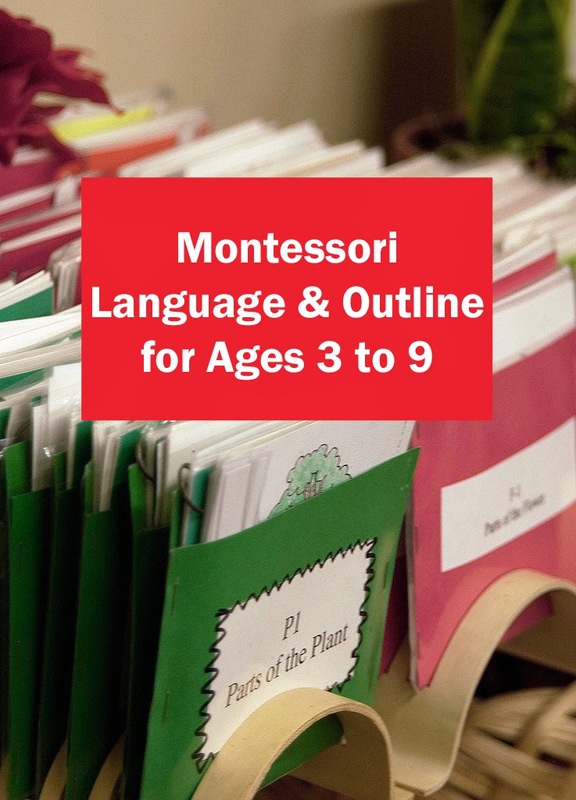 I am sharing my Montessori training lecture notes on language, an introduction and outline, for ages three to nine. The most important concept in early language development is that the child has to become aware that language and words are made of sounds. We achieve this with the help of the I Spy Game. The next step is to introduce the symbols that represent these sounds with the help of the Sandpaper Letters. Dr. Montessori believed that it is important that the child expresses his or her own thought in writing, and only later on learns to read. The symbols written by someone else consequently we concentrate on strengthening the child’s ability to control the pencil by work with the Metal Insets after they have achieved mastery it is easy for them to trace the sandpaper letters. The last step in preparation for writing is the work with the Movable Alphabet. When the child is able to break a word down into its component sound and then picks out the corresponding symbols from the Movable Alphabet box. He learns to construct words. Once his writing ability has improved sufficiently, he will not be bothered to take letters out of a box but he will write the words himself. Approximately six months later the child will proceed to read back his own writing. That is when we introduce the Object Box which Dr. Montessori called "the doorway to reading". Here the child identifies simple three-letter objects (phonetic, as in c-a-t) then proceeds to decipher the corresponding words written by the teacher. The next step are the Reading Tablets. Here the child can practice individually the process of reading by matching labels to pictures. This work is reinforced by all the materials of the Cultural Subjects which use Classified Cards. Dr. Montessori firmly believed that a child’s language development should always be related to concrete experiences. The materials of the Cultural Subjects are related to experiences which the child has enjoyed repeatedly and have been expanded by artwork. This is stared before the has started to write the names or try to read the names and definition. The Definition Booklets related to the Cultural Subject cards progressively lead the child from mechanical reading to comprehension reading concurrently with the reading experiences we introduce two very important materials: Phonogram Booklets and the Puzzle (funny) Word cards. These two materials help remove obstacles which may frustrate the child’s reading progress from phonetic reading to the reading of words which cannot be sounded out to further enhance and practice. The child’s reading-ability Grammar Games are introduced, first the concept of the noun followed by the adjective and the article then onto the verb, adverb, conjunction, preposition and personal pronoun. All those experiences involve a lot of activities: writing, reading and the placement of grammar symbols. It is important to relate these experiences back to back with the Classified Card Definition booklets or any other language development exercises other language development exercises such as dictation, spelling, writing pretty, writing a story or an essay, punctuation, poetry and drama should also be included as well as good literature and jr. classics. Once the grammar concepts have been assimilated by the child the Grammar Boxes can be introduced. This work leads to Sentence Analysis. Sentence Analysis should be related back to any kind of workbooks, readers or jr. magazines that the children are using at school. Introduce their own compositions. Sentence Analysis requires a change of concept and manes for the children to understand. Here we use materials called Sentence Analysis Chart & Arrows. For example, the verbs becomes a predicate, the noun becomes a subject or object and every other word in the sentence is then diagrammed. Concurrently language and vocabulary enrichment is developed by the use of synonyms and antonyms. Use of dictionaries and encyclopedias. The children are encouraged to do their won research, write down outlines in their own words and then improve their own words by researching other expressions from the ones they have used. The appreciation of language and particularly good language, will be the outcome of the study in an age when many college students have difficulty reading or writing a paper. This endeavor is of the utmost significance. I Spy Game: Beginning sounds, first object in hand, other person, go out of the circle to the children, go out into the environment and lastly out of the door. Next go to ending sounds and then the middle sounds. Point of Arrival: Ask the child “Could you please bring the ch-ai-r." I spy makes them aware of sounds. Do this everyday at circle. Sandpaper Letters: These are introduced only after the child has done the I Spy Game and is aware that language is made up of sounds. (tactile)." Pick two other names. "Can you think of other words that start with S?" 2. Give 3 period lesson. right hand, say sound. Pick up pencil and write sound on first square. Repeat. Circle: After I Spy, sing names, sing a-b-c song and point to symbols and sing it. Lastly, point to the sound and ask “What is this?” To reinforce I Spy use cultural subject cards, vocabulary words (b – bay…). "Cat, what is the middle sound... a. Ending sound... t. Do more a words if child is interested. This is the concrete experiences of expressing their thoughts. The spiritual aspects of writing is answering your own thoughts, breaking it down into sounds, and expressing it with symbols. Writing with Squared Paper: Fold to make a book. write letter in squares from left to right. 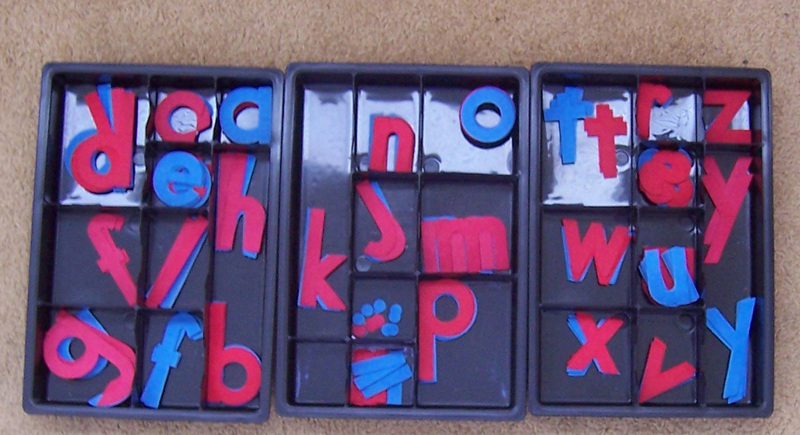 Metal Insets can be introduced for control of pencil in writing. Cultural Subject Cards can be used for tracing labels and pictures. 1. Use same words as the ones in the movable alphabet lessons (no erasing, cross it out instead). 3. Next day do a contrasting vowel. 1. Use after child has written a lot. and writing down symbols, start from yourself. The child has to take someone else’s symbols, change them into sounds, connect sounds, and make into a word and give meaning to that word. 2. “Give me the thing." 4 All things have names. Look at a thing and give me the name. 5. Names of things are nouns. 1. Write it down, phrases, and draw symbols on top. 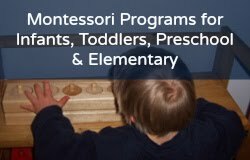 Want more Montessori language? See my book recommendations for Montessori reading and phonics! Check out my Read and Write the Montessori Way ebook; or read more language blog posts here and here!